The Comet has an amazing history that started at Crystal Beach, a waterfront amusement park located in the Canadian city of the same name. 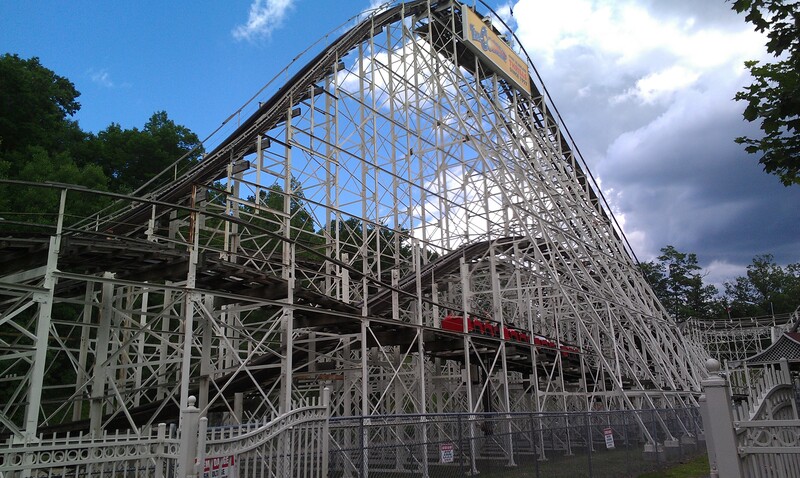 Situated on the side of Lake Erie, the park opened in the early 1900’s and had quite a few wooden roller coasters through the years. In 1926, the park hired Harry G Traver to design and build what was known as one of the most terrifying roller coaster ever! The scary Cyclone only had 2800 feet of track that were travelled in less than 40 seconds. There were no slow sections, the turns were too tight, the helix too intense and the first drop a tight near vertical twisting affair. The park hired a nurse at one point to stay in the station in order to revive riders that had fainted from the insane trip. Even with a steel structure to save space and reduce maintenance, the roller coaster was dismantled in 1946 due to its reputation. It was so fearsome that most people would rather just look at it then pay to ride. It eventually got to the point where the ride was too expensive to keep. In 1989, the park closed and every piece of equipment in the park was auctioned off. Charles R. Wood from Queensbury, NY successfully bid 210 000$ to win the ride. Charlie Wood owned 3 properties at that time: Fantasy Island in Grand Island, NY, Gas Light Village in Lake George, NY and Great Escape in Queensbury, NY. After winning the auction, the structure was carefully dismantled and the ride moved to his nearby property, Fantasy Island. It stayed in storage there and in order to afford the reconstruction at Great Escape, Mr. Wood had to auction off his priceless PTC Carousel (at Great Escape). Martin & Vleminckx (M&V) were hired to do the reconstruction and do the new track work. The track work is the main reason why moving wooden roller coaster is so rare and so expensive. When you rebuild the ride, the track work has to be redone completely, like if you had a brand new ride. Martin & Vleminckx selected the highest quality Douglas fir lumber they could source for the new track. 1000 new footers were poured and the park staff sandblasted and repainted in white every pieces of steel from the structure. M&V did the reconstruction and some consider their track work on the Comet to be the best ever. It was absolutely perfect and faithful in every ways to what PTC had delivered in 1948. After the first season, additional bents were installed in the form of 300 lbs oak stakes that were placed at the bottom of the drops to provide additional bracing. Now, what will run on the ride? The two original trains were in too bad of a shape to run again, so new rolling stock was required. The park original decision was to buy two new Morgan trains for the ride, but when the American Coaster Enthusiasts (ACE) members heard about it, they contacted the park and expressed their concerns about that. Finally, Great Escape went with two new 3 benches PTC trains. Each train has four cars and each seat 6 riders, for a total of 24. Originally, the trains were equipped with a seat divider and an individual orange ratcheting lap bar. 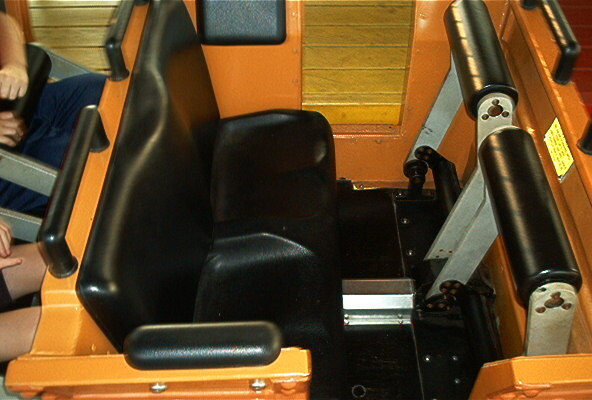 Seatbelts were added in the late 90’s after Premier Parks took over the park. Second turn behind the station. 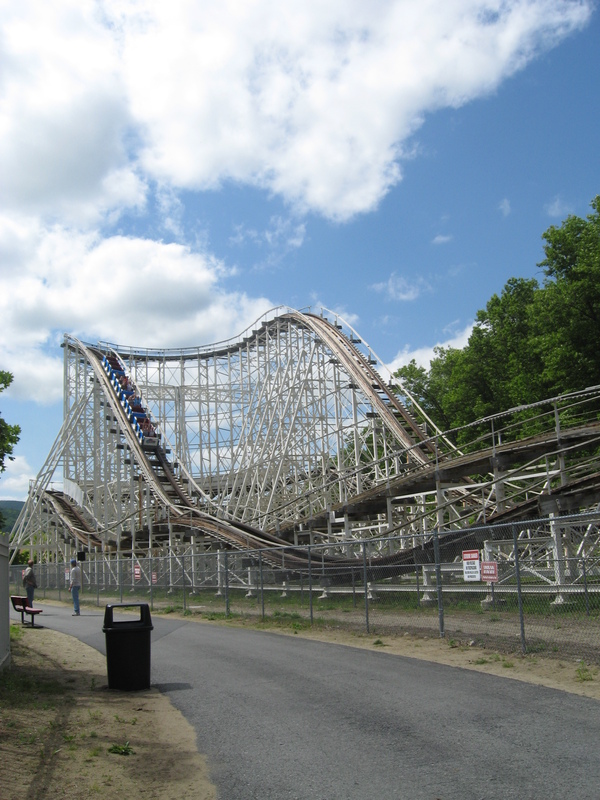 The ride was named an American Coaster Enthusiasts coaster landmark in 2009. The lattice station. Note the split in two waiting lines. For some time in Crystal Beach, the ride ran with half the cars facing forward and the other half backward. The station had been modified for that. The first turn. One difference between opening and today is that the exit of the turn was banked a little. The train in this picture is racing back toward the station after turn 3. 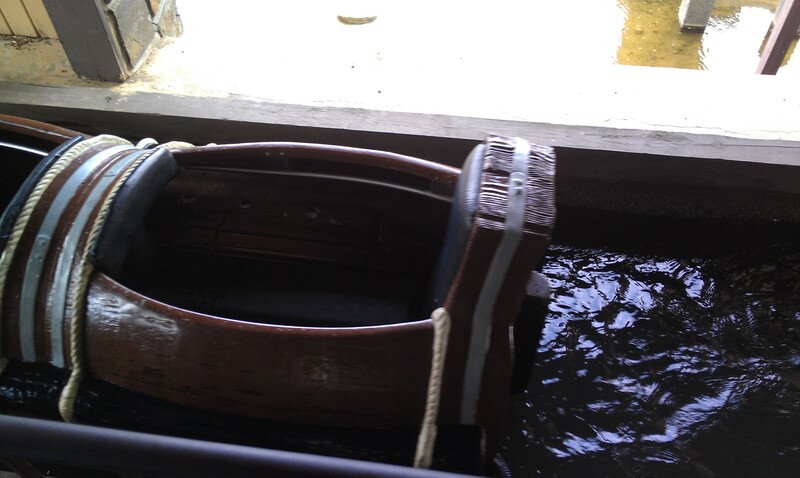 This is the brake run of the ride. The ride was originally equipped with a curved friction brake area to stop the trains. 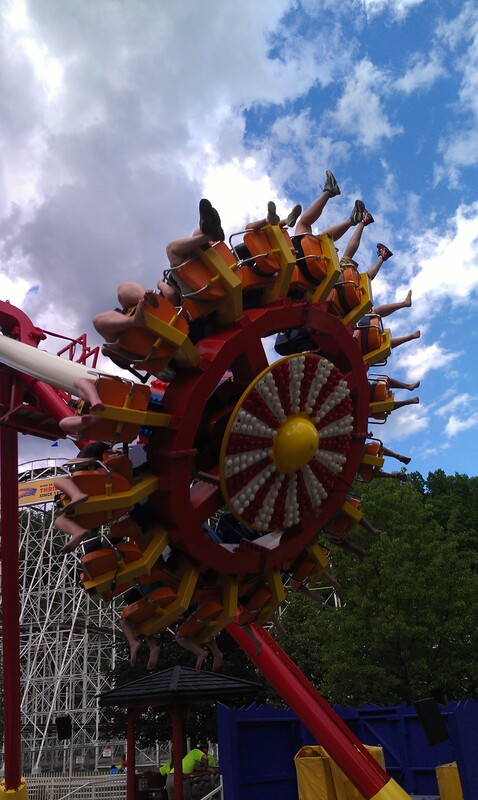 When M&V rebuilt the ride, they installed PTC pneumatic fin brakes in the straight part of the braking area. Another brake caliper was put right before the transfer table and that is where the second train will wait when the station is occupied. The transfer track has a single brake caliper and the station itself two. The Comet replaced part of the campground in the back of the theme park. 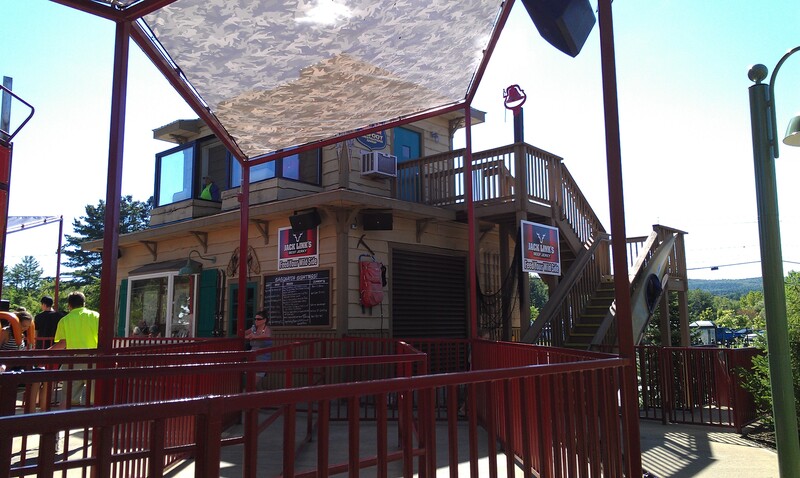 Most of the original station lattice work was preserved and reinstalled at Great Escape. This was not the first time that the Great Escape recycled rides. When Freedomland in New York City closed, Charles Wood purchased a few of the park rides and large scenery and moved them to both Gaslight Village and Great Escape. The old Mine Caverns became the Ghost Town Train that went through an abandoned western street and then through the caves. The trackless train “Danny The Dragon” was also moved to the Great Escape and removed in 1996 when its location was used for the brand new Boomerang (1997, Vekoma Boomerang). The Crystal Maze was used as an attraction for some times and then was used as a concession stand. Some of the figures from the Northwest Fur Trappers dark ride were integrated to the predrop building of the Desperado Plunge at Great Escape. Desperado Plunge is actually another relocation from the thrifty owner when he sourced the nearly new Arrow Log Flume from the closing Busch Gardens California (Van Nuys, CA). He purchased the ride troughs, logs, lifts, pumps and station equipment and then rebuilt a new layout with it. The layout he came up with added a long rapid section in a custom cement trough between the station and first lift hill. The final drop of the ride. The most well known of the rides Charles Wood saved from Freedomland was the Tornado dark ride. This unique dark ride was in the Louisiana section at in New York City and simulates a trip through the country side when the dreaded tornado hit. Very imaginative and with a new exterior and redressed inside, it was an easy fit for the western themed Ghost Town at Great Escape. It opened in 1962 and closed down in 2003. 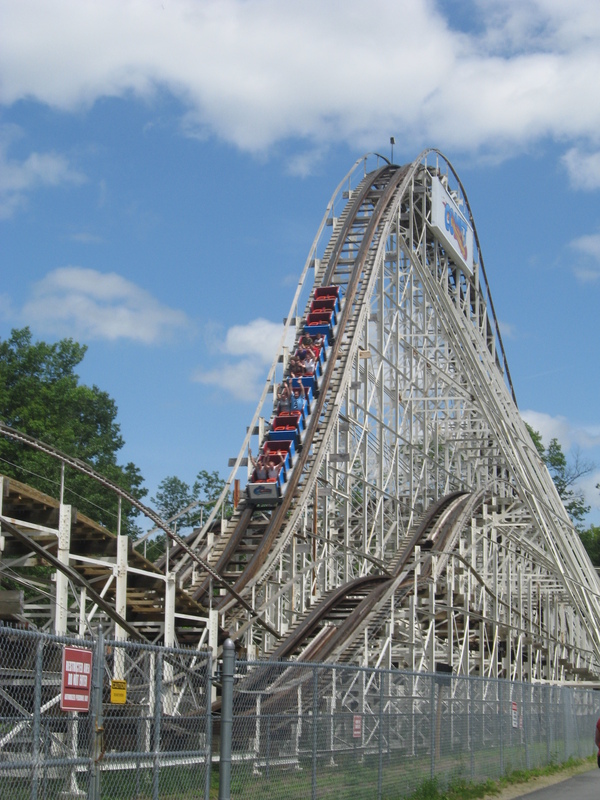 In 1984, Charles Wood purchased a roller coaster from the closed Pontchartrain Beach in New Orleans, LA. 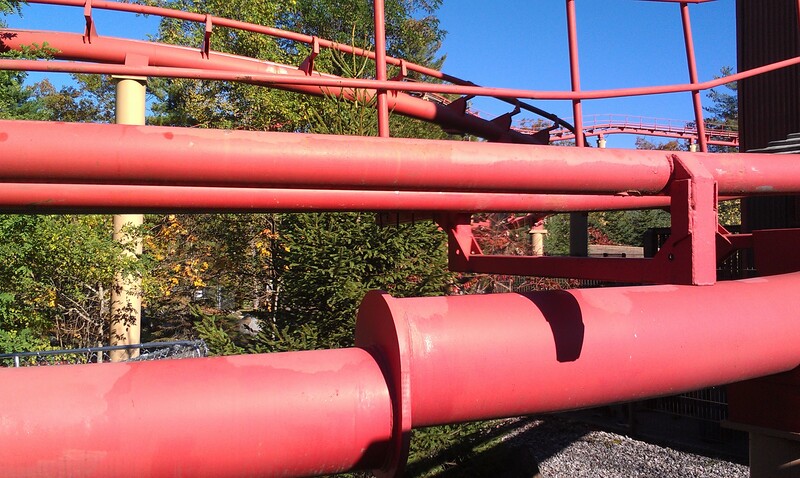 This was a standard Loop-Screw from Arrow Development and a custom hill was built for it at the Great Escape so it can serve as a major billboard for the park. It ran its original train until 2007, when it got a used Arrow Mega Looper train from the Shockwave at Six Flags Great America (Gurnee, IL). When the Shockwave was scrapped in 2002, part of the ride was preserved. The trains were kept in storage and one of them was rebuilt and repainted. It replaced the original 1978 train at Great Escape. 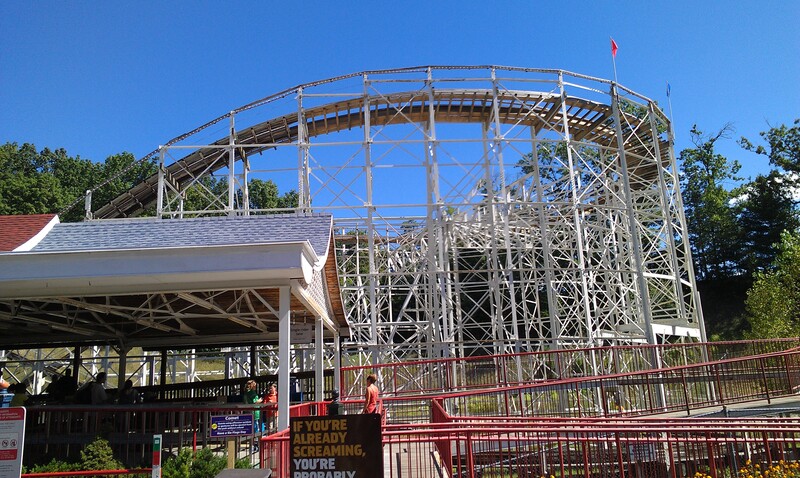 The ride on its hill at the park entrance. The 2008 train. Note the very high seat back. 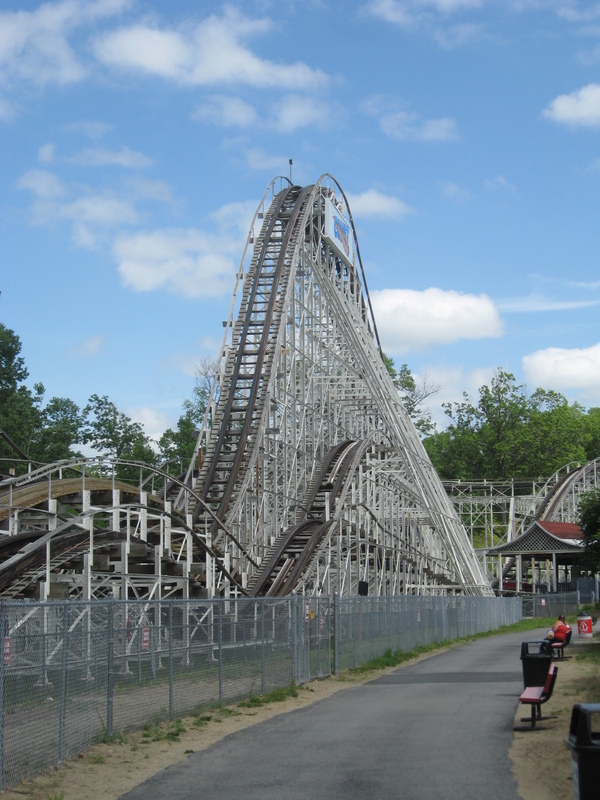 When Premier Parks purchased Great Escape in 1996, the preservation efforts continued. 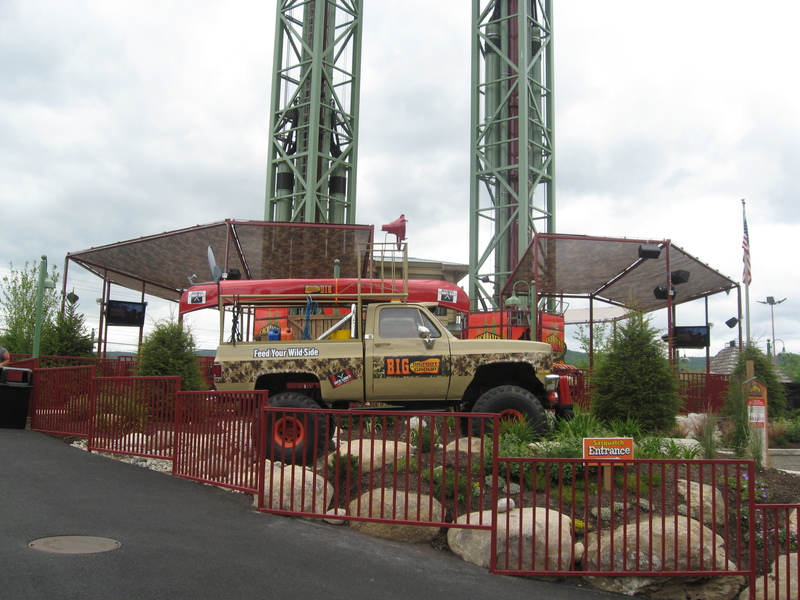 1998 saw the purchase of the Intamin Swiss Bobs roller coaster that had been in storage at Six Flags Great America and it was installed in a nearly empty spot between the Raging River ride and water park. That particular installation started its life in 1985 at Six Flags Great Adventure (Jackson, NJ) as the Sarajevo Bobsleds. 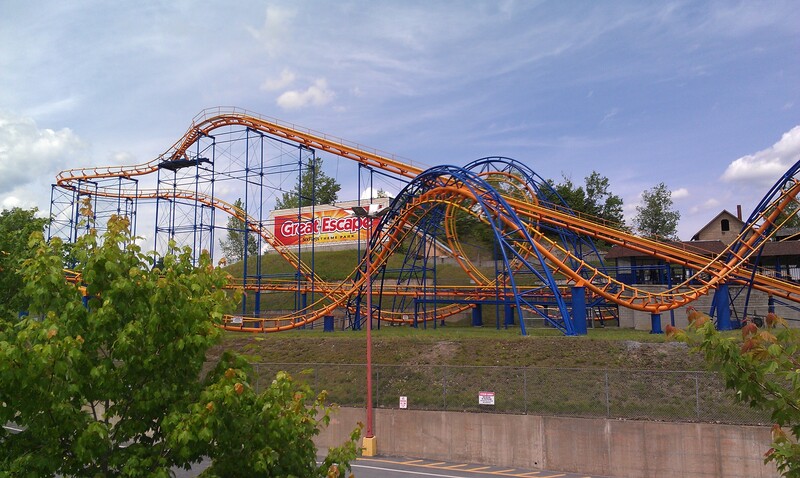 In 1989, it was moved to Six Flags Great America (Gurnee, IL) and Bolliger & Mabillard were involved in the move. It was their first ever project as a stand-alone engineering company. 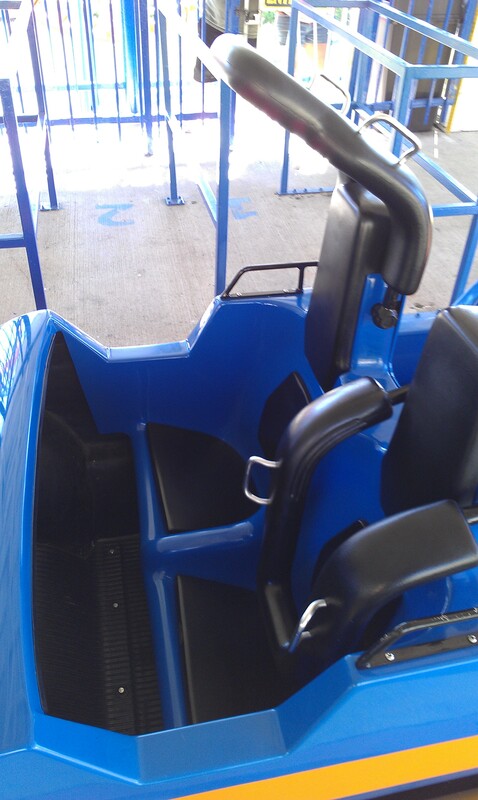 They designed new cars for the ride that moved from the original 3 benches, 2 riders in line per bench seating to a higher capacity 4 rows of two with an individual restraint. It is a major improvement in every ways and on a remarkable note, all within the original weight and size specifications. When the ride moved to the Great Escape, it was themed as the Alpine Bobsleds to honor the nearby Lake Placid winter Olympic site and the trough painted a beautiful white-purple snow flake pattern. The support columns were dark green and each car painted a color representing the countries that participated in the Bobsled completion that year at the Olympics. It was wonderfully integrated with an alpine chalet station and today, the trees grew to hide most of the ride. In 1999, everyone’s worst dreams came to life as the Nightmare inhabited a deserted mine in Ghost Town. Starting in the 1970’s as Starchaser at Beech Bend in Bowling Green,, KY, this particular ride was a Jet Star from Schwarzkopf. What made this one different was its location: inside a large dark warehouse with lighted disco balls to simulate a star field. In 1984, the ride closed and the ride moved in 1987 to Kentucky Kingdom (Louisville, KY. It kept the Starchaser name and it was housed inside a new warehouse with the disco balls. After 1995, Starchaser was again sold and this time, Premier Parks purchased it and housed it in a brand new hangar with a new theme, Nightmare at Phantom Cave. Finally, its last move came when Premier Parks moved it from Darien Lake (Darien Center, NY) to Great Escape in 1999 because it had too low capacity for the flagging of Darien Lake. What is interesting is that at both Kentucky Kingdom and Darien Lake, the warehouses were usually the largest buildings in the park and thus, were recycled as they were still in great shape. At Kentucky Kingdom, it became the Thrill Park Theater, a motion simulator attraction and at Darien Lake, a stunt show arena. In 1999, it housed the Batman Thrill Spectacular and after Six Flags sold the park, became the Galaxy Theater housing various shows. In 1999, the park reorganized both the Desperado Plunge and Ghost Town train. 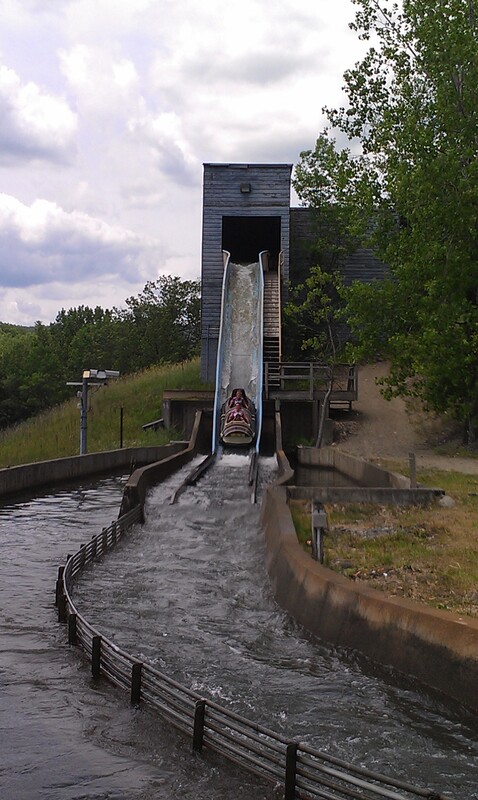 The original rapid section of the Plunge was made shorter and the Ghost Town Train was also shortened. This was to accommodate the large painted soundstage that became the home of the wandering Nightmare. A large elaborate outdoor waiting line started as soon as you went under the Desperado Plunge channel and then you were in the middle of a western mining camp. You then entered the very dark mine and then made your way toward the toboggan style Jet Star cars. The ride itself was fun and a unique experience, but it was hamstrung by a terrible issue: capacity. At least one car was damaged during transport between Darien Lake and Great Escape. Also, due to concerns with the braking system, only two riders were allowed in a car and only one car could be on the track at once. So, they only ran three cars with two riders, giving a miserable 120 people per hour. 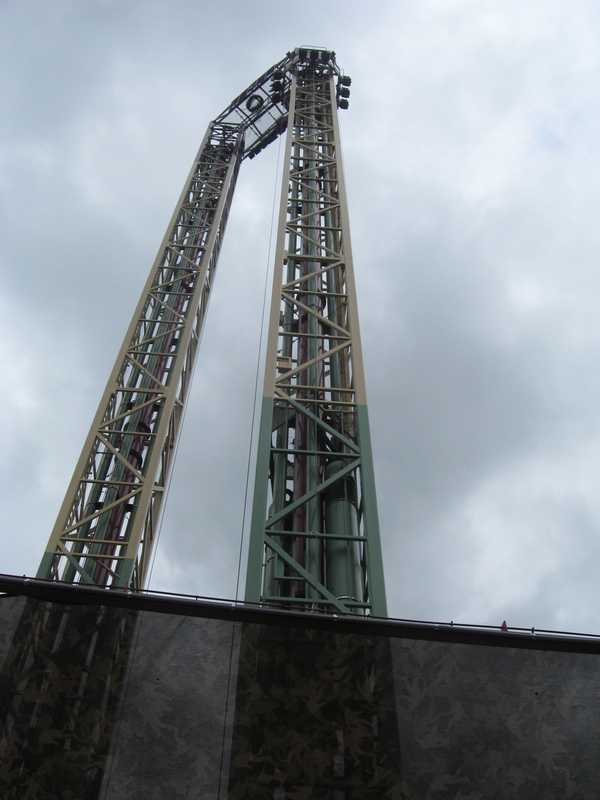 The ride was closed for most of 2002 as the park struggled to improve capacity and finally, the Nightmare was expropriated and the ride scrapped after 2006. 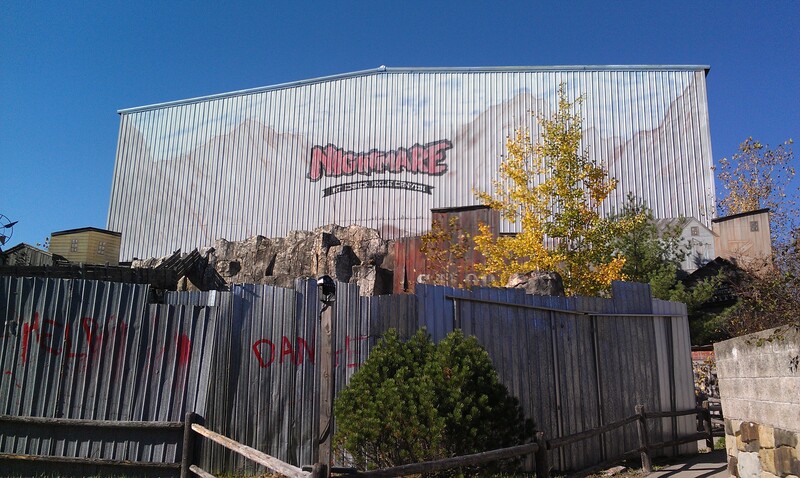 The soundstage was kept for storage and in 2013, became a new haunted walkthrough for Halloween, appropriately called the Nightmare. The Nightmare building. The ride inside has been removed and scrapped. In 2003, another roller coaster was moved to the park. The Canyon Blaster was originally an Arrow Runaway Train installed as the Rock n Roller Coaster at Opryland (Nashville, TN) and was purchased along with most of the park rides when it closed in 1998. 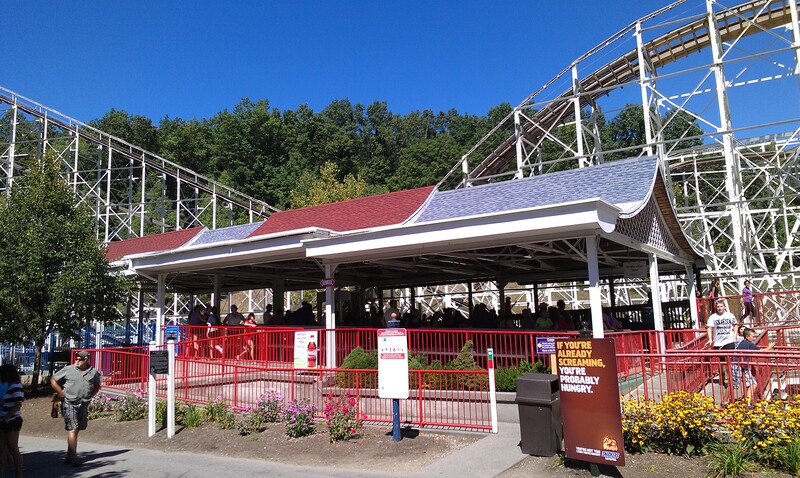 After staying a few years at the closed Old Indiana Fun Park (Thorntown, IN), the ride was moved to Great Escape. Due to deterioration and the need to fit a more compact site, new track section were manufactured by Morgan Manufacturing and the ride opened with two trains (5 cars of 6 riders). Canyon Blaster replaced both Ghost Town Train and the Tornado. Ghost Town Train scenery and trains were recycled as theming for the ride and the Tornado put in storage. 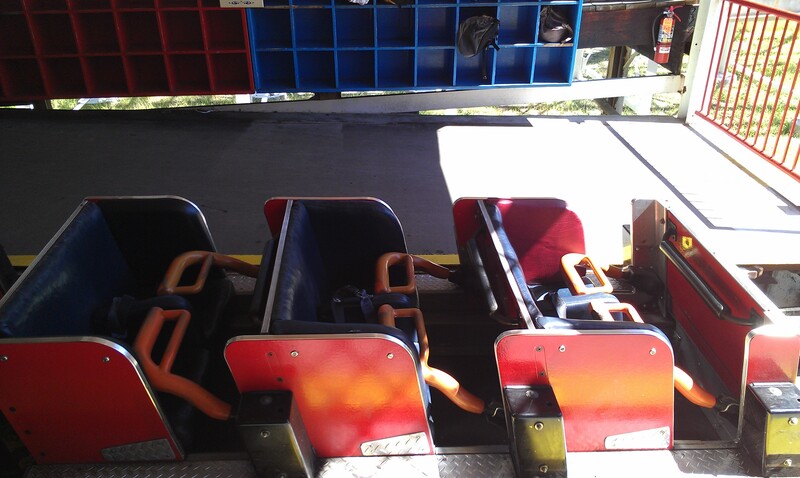 After a few years, the park had one train converted by Premier Rides to individual U shaped restraints. 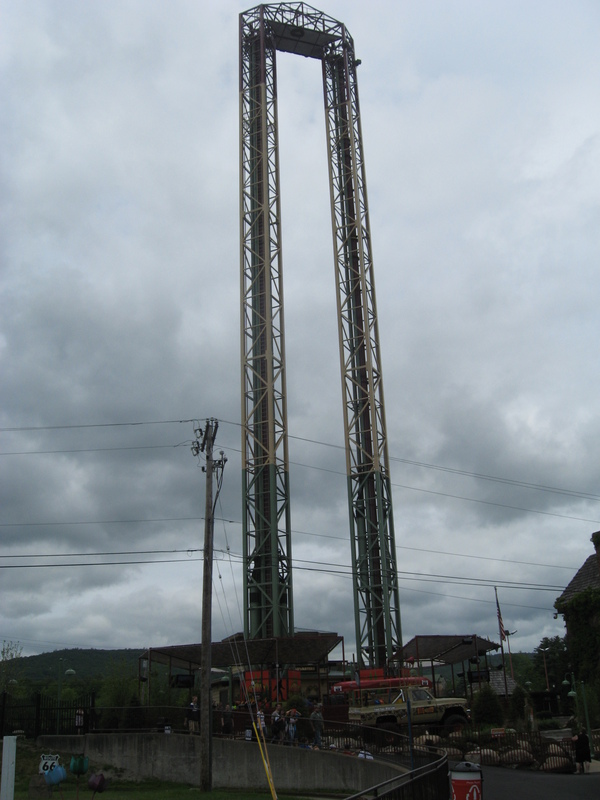 In 2009, Six Flags moved the two old S&S towers that were flooded by Katrina at Six Flags New Orleans (New Orleans, LU). The pneumatic cylinders, ride electronics had to be replaced, but the towers and cars themselves were still good. They were refurbished, repainted and given a nice integration near the main entrance where the Huss Rainbow had stood. Waiting line and Operators booth. 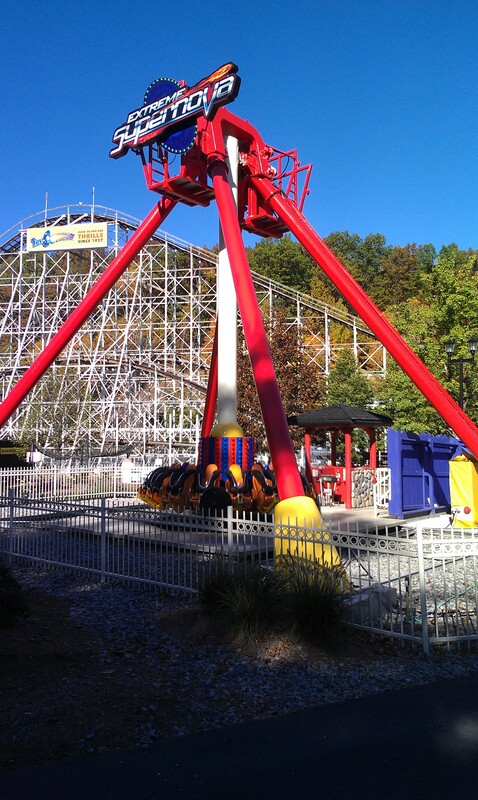 In 2014, Great Escape installed the Extreme Supernova, a Midi Discovery from Zamperla that came from Luna Park in Brooklyn, NY. The ride when loading. The metal floor split and slide to the sides to allow the disk to swing through. The swinging car and notice the lighting package on the bottom. It was retained from its days at Luna Park. 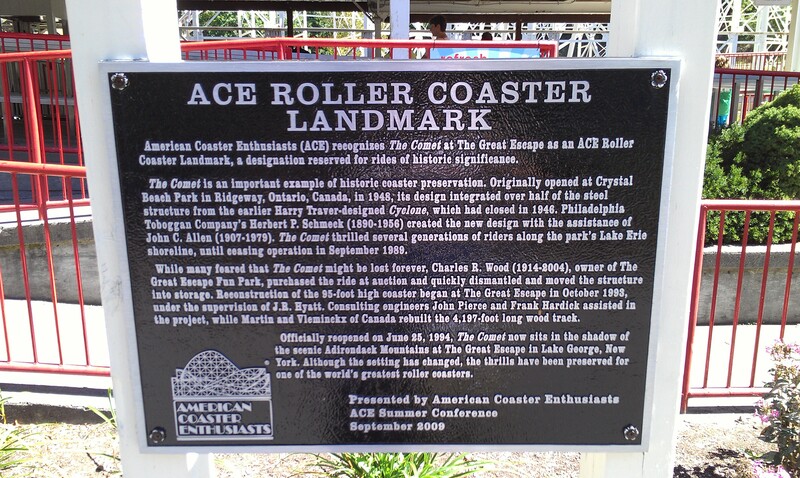 This entry was posted in Coasters and tagged Coasters. Bookmark the permalink.